This weekend I met up with a group of friends to add Bamboo Aerial Yoga to my I-tried-it list. If you have seen the enviable photos of aerial yoga over the sea, you probably understand why I didn't hesitate to accept the invitation to join the fun. We attended a three part full day workshop for beginners. 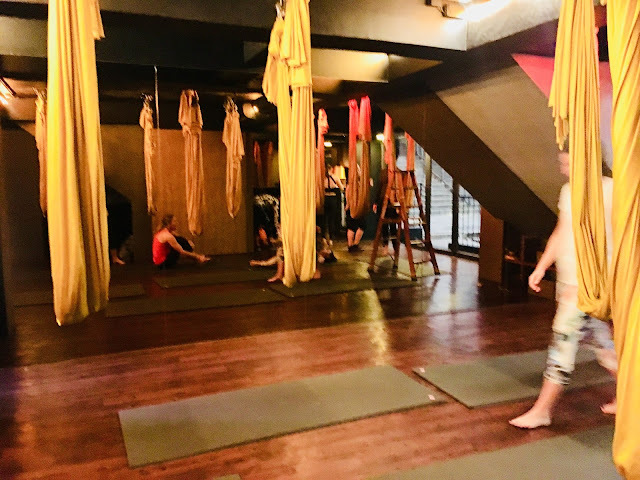 First we met up at the Yoga Bambam studio in Central for an introduction aerial yoga lesson. Our instructor (and founder of Bamboo Yoga), Aleksandra, showed our small class of nine how to do 8-10 different poses and gave us plenty of time to practice during the hour-long session. After a break for brunch at Mana, we taxi'd across Hong Kong to Sai Kung and hiked to the beach. The 30-ish minute hike to Sai Wan Beach was mostly downhill, so it was easy to chat with each other and enjoy being in nature along the way. At the beach we had time to change our clothes if we wanted. 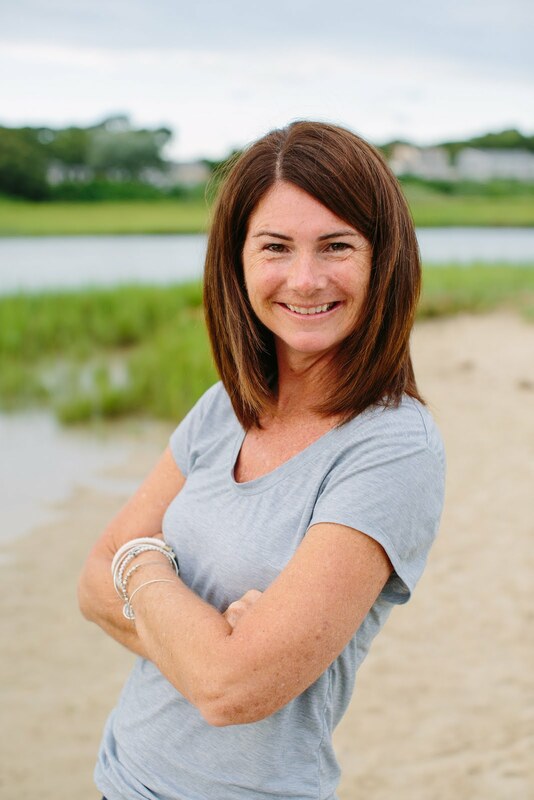 I decided to put on my yoga shorts and keep my capris dry (affiliate). We did a warm-up yoga flow while Aleksandra and Melissa, another instructor, set up the bamboo tripods. 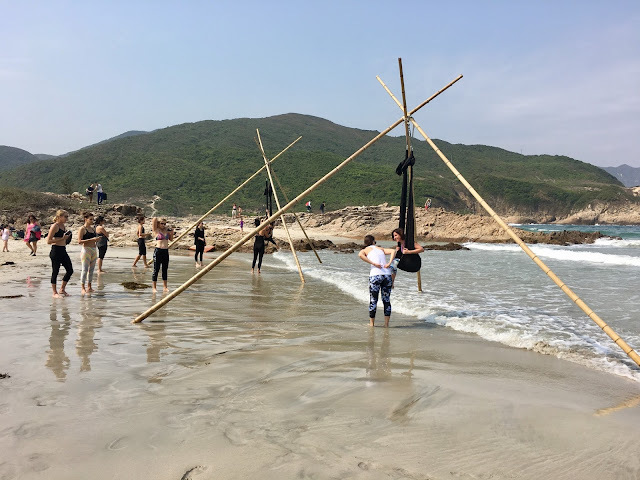 With two bamboo tripods erected, our class was split into two groups for the 90 minute beach session. Our group of five stayed together and took turns going through the poses we learned in the morning session. We first had to learn how to get into the hammock. The hammocks are hung higher than normal over the water so that while you are posing upside down, you don't have to worry about waves getting in your face. Basically for 90 minutes it was all about getting the photos. With the help of our instructor, Melissa, we did all the poses from the morning and a couple of extra for fun ones that we saw her do while we took a break. 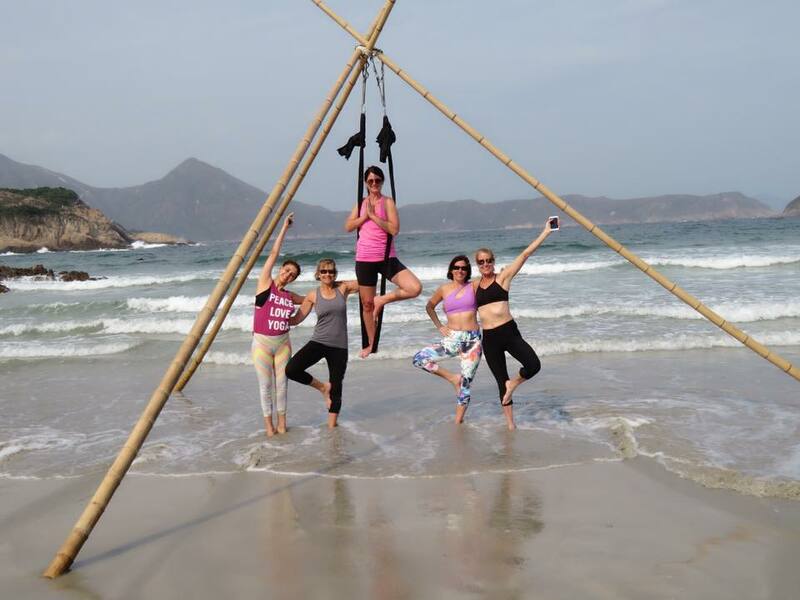 Even though none of us had ever done aerial yoga before, the backdrop of Hong Kong mountains and the South China Sea made all of our poses #instaworthy. This was definitely a fun activity to do with friends! After the class, we took the water taxi back to Sai Kung. The views from the boat were just beautiful. Hong Kong is an amazing place to live and play! Have you ever tried aerial yoga? Would you try it over water at the beach? 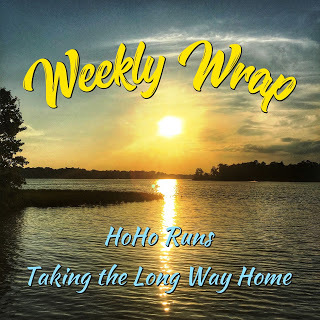 I’m linking up with Holly and Wendy for the Weekly Wrap! After a really big hike on Monday, the rest of the week I focused on low impact workouts. Both of my knees have been feeling a bit achey after some serious descents on my last two hikes, so I listened. I've been wanting to to become a regular swimmer, so the timing was good motivation to get to the pool. The indoor pool at the fitness center has 25 meter lap lanes and I went with a goal of swimming for 20 minutes. I read somewhere that a beginner swimmer should swim for at least 20 minutes 10 times over a three week period before trying a workout. So, that's my goal. 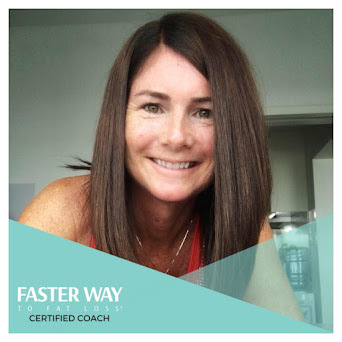 My other workouts focused on strength training. I haven't been wanting to go to classes, like Bodypump, lately because I'm in the mood to be on my own schedule. So, I dug out an old arm workout that is quick and dirty ---> which means easy to do (at home or at the fitness center). I tried to find a similar one for a leg workout, but instead ended up making my own. Swimming humbled me and strength training made my legs really, really sore. Sunday - yoga stretch - I really needed that! Tell me something about your week! 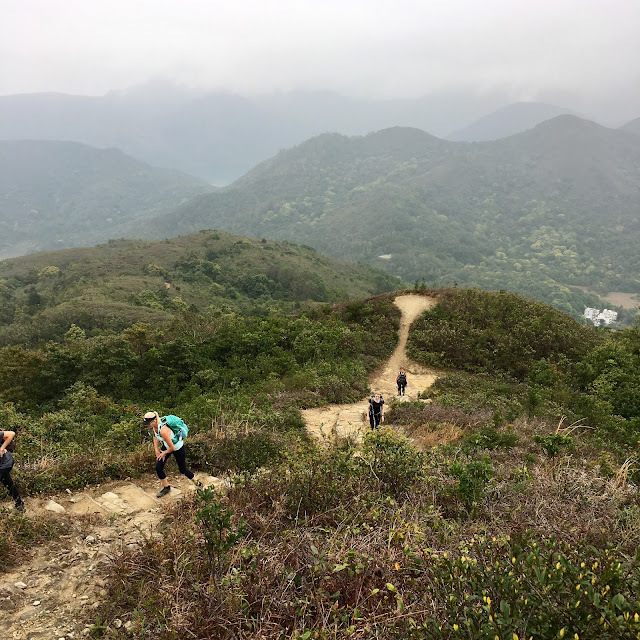 They say that stage 4 is one of the toughest of the Maclehose Trail. I sure hope so, because it was hard hiking. Thank goodness for compression socks! The hike starts with a strenuous climb up to 540 meters (we started around 80). At the top, I stared at the towering peak of Ma On Shan (702 meters) and thought about the day I might conquer it. The reward after that big first climb is getting to spend time in the uplands and walking along the ridge. I thought this would be a great place to sit and enjoy a packed lunch while taking in the panoramic views over Sai Kung and Ma On Shan. 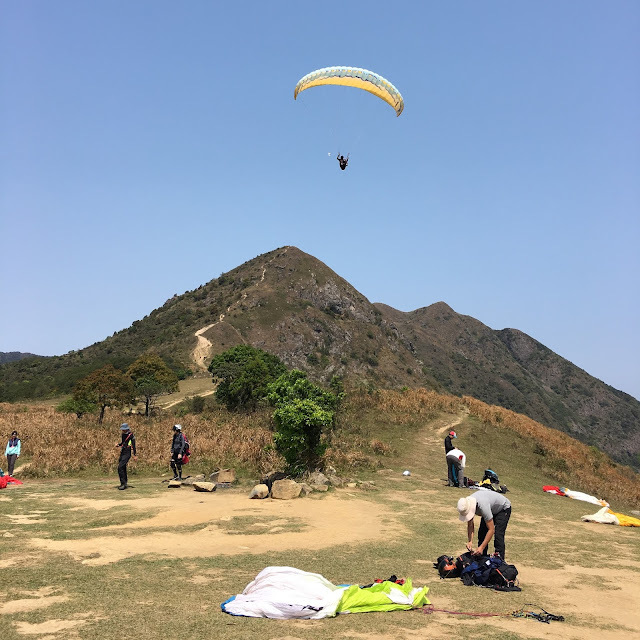 The ridge eventually takes a big descent down to Ngong Ping viewing area which is where we found loads of paragliders. This was an excellent spot to take a little break and grab a snack. You would think that big climb is what makes this stage so challenging. For me, it was the big descent after and the multiple ups and downs after that. Descents are hard on the knees, and REALLY hard on mine. The final descent was the toughest, but we did get some amazing views all the way toward Central. Stage 4 ends in an awkward place. If you are hoping to find public transport at the finish, you either decide to do this hike backwards with a big walk-in or carry on to stage 5. 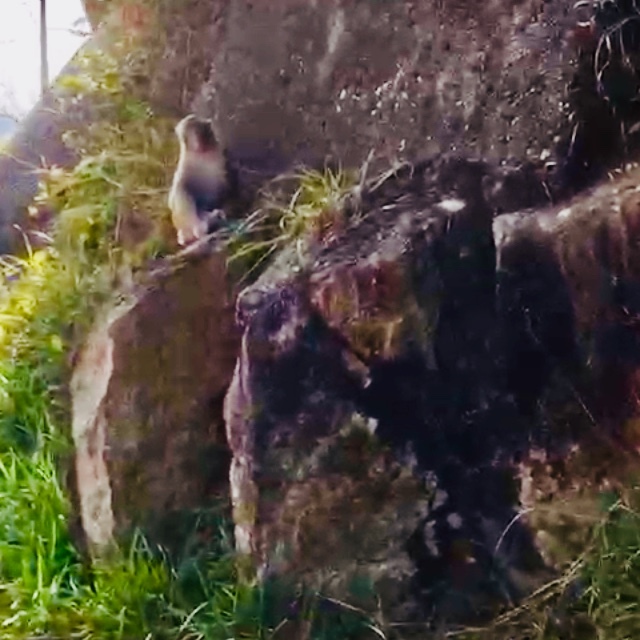 Our hiking group opted to have a big walk-out at the END...this was about another hour walk down a sloped road through the land of monkeys. 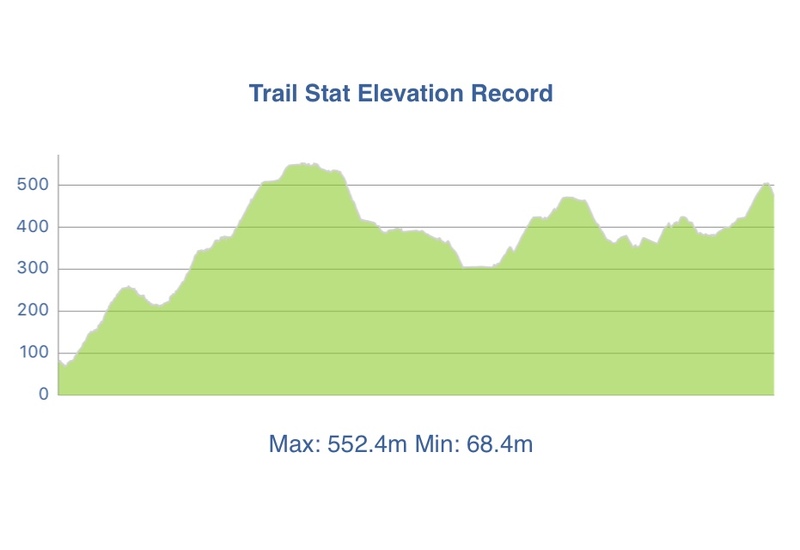 View from the top and the elevation chart. The view makes all that climbing worth it! In a couple of weeks we will be moving on to the next stage and I'm hoping the hard part is behind us. 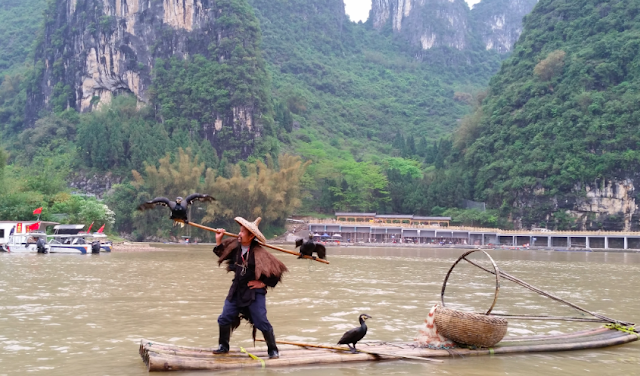 I went on another China adventure to the land of karst mountains and had so much fun! We hiked, we rafted, we explored, we ate and we laughed. 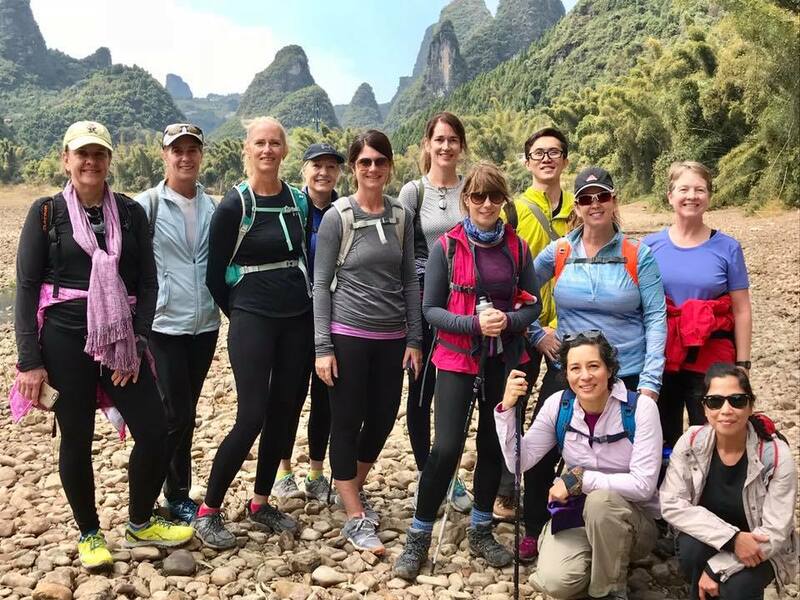 My membership with the American Women's Association offers me the opportunity to do many things including take trips around Asia. 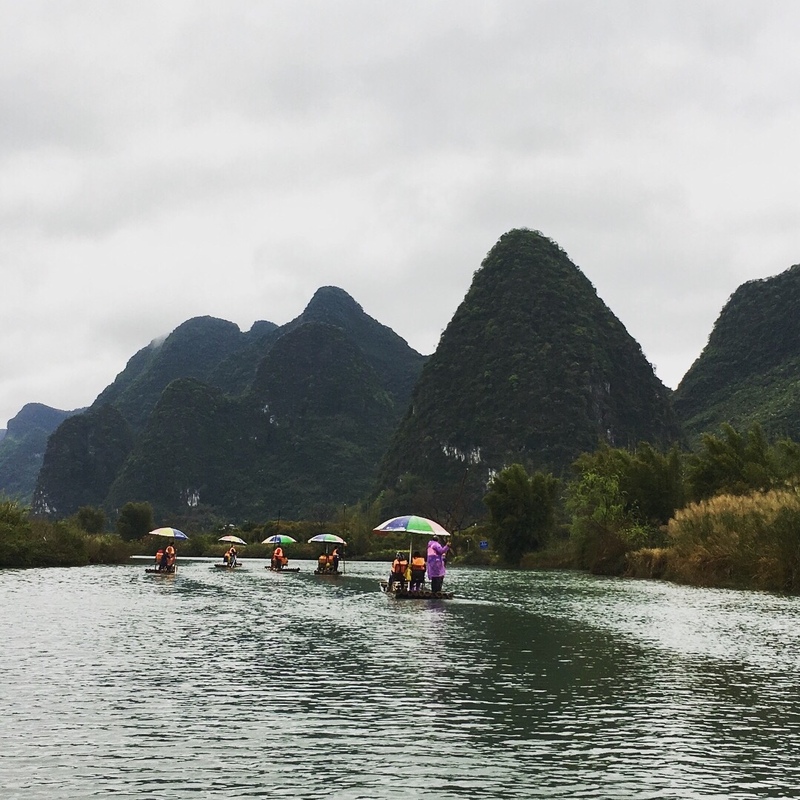 I've been to Kaiping, Harbin, and now Guilin where the famous karst mountains are located. 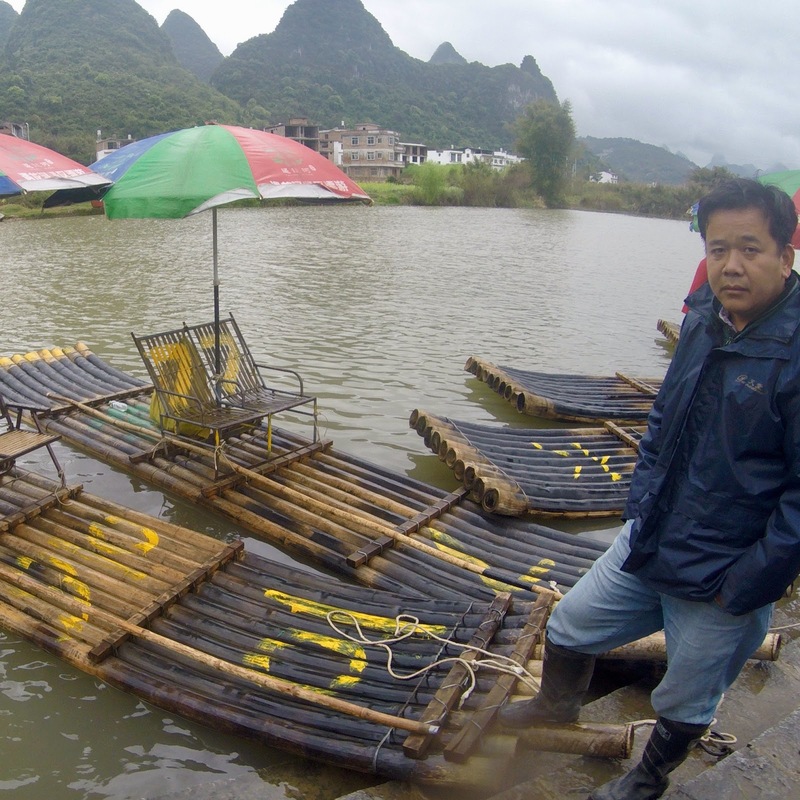 The morning that we took the bamboo raft ride was rainy and overcast, but it didn't dampen the fun at all. Our rafts were authentic bamboo with the driver using a bamboo pole to push us down the river (we would later see larger rafts with motorboat engines attached and be grateful that we had a genuine experience). The views from our bamboo raft were absolutely stunning! The karst mountain peaks loomed all around us and the countryside was so peaceful. We did have a few exciting moments as the rafts dropped over terraces. The first one was a little scary but then after that it was just fun. We pushed our hiking trip to the next day and it was worth the wait. The hike began with a moderate climb to Xianggongshan where we had amazing views of the Li River and the karst mountains. The rest of the trail took us through beautiful countryside including right through mandarin plantations. The employees were very friendly as we passed by and our guide gave us each a mandarin orange. At the bottom of the mountainside our hike continued along the Lijang River to Xingping old town. 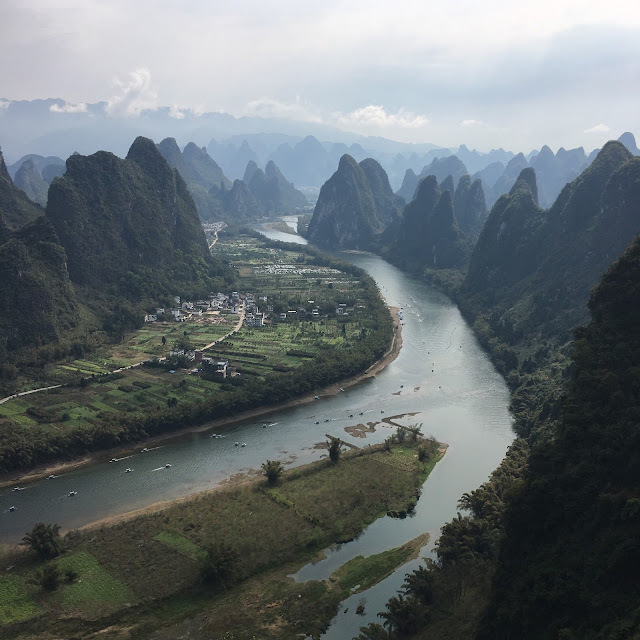 I signed up for this trip because I wanted to see the karst mountains and because we would hiking and bamboo rating down the Yulong River. I like sightseeing, but I like adventure sightseeing even more. It was exactly what I hoped. Monday - Trip prep - lots of walking! This week I spent more time with The Stick rolling my quads than anything else. Rolling with the stick gives me more control to hit the trigger spots than using my foam roller. And, Oh. My. Quads! It hurt so good. Let me try to explain what happened. On Monday, I went on an amazingly big hike and felt pretty good. I was tired, but not too tired to catch up on my core challenges when I got home. I even felt good on Tuesday, so I went for a 3 mile run in the morning. I had a small issue with my hip at the very start (like it wanted to pop or something), but then I was fine. When I woke up Wednesday, my quads were sore and my knees hurt. KNEES ---> both of them were feeling achey. My right knee (my good one, ha!) actually felt the worst. I spent the day with a group of friends exploring the Dafen Art Village and my quads started feeling worse and worse. I guess that big hike shredded my quads more than I realized and then I ran the next day. It was such a big delay of soreness that it really surprised me. I sort of lost my motivation to workout after that. On Thursday I did a little upper body strength training at home. I had a busy day running errands on Friday which was my excuse to give my legs a break later when I thought about working out. I honestly don't know what happened Saturday. I just couldn't get into a fitness mood. 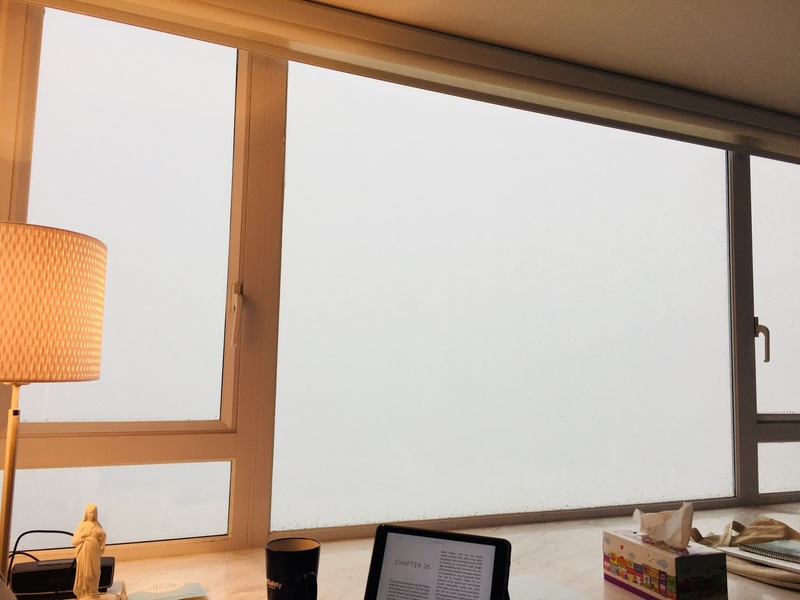 I had a brief moment on Sunday when I thought I would go for a run after church, but then the fog descended on Hong Kong. So, it was kind of a weird week for me and my fitness. I'm hoping to shake it off today and get in a good workout. 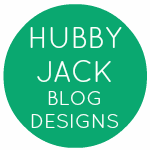 Any words of encouragement to help me? That should be the mantra heading into this hike because the climbing is no joke. 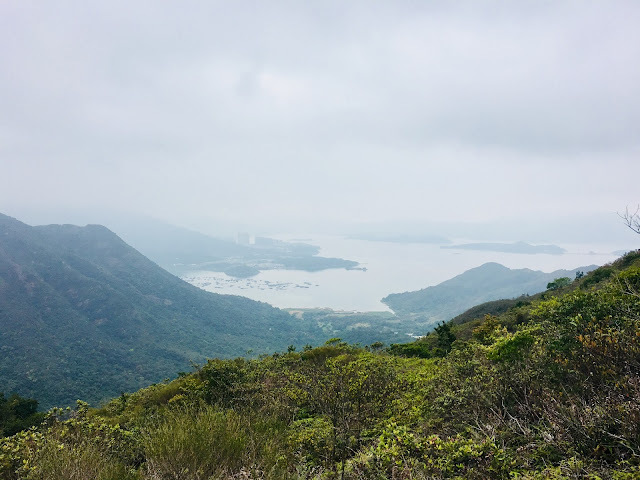 I'm on a mission to hike all 100 km of the Maclehose Trail in Hong Kong. Unofficially, I started this trail when I hiked stage 2 with my SWIC hiking friends a couple of years ago. Now I'm teaming up with my AWA hiking friends to hopefully finish this beast. Stage 3 of the Maclehose Trail is rated difficult because of the multiple climbs and rugged trail. You won't find any concrete paths or stairs on this one, but flat rock steps help on the ascents. 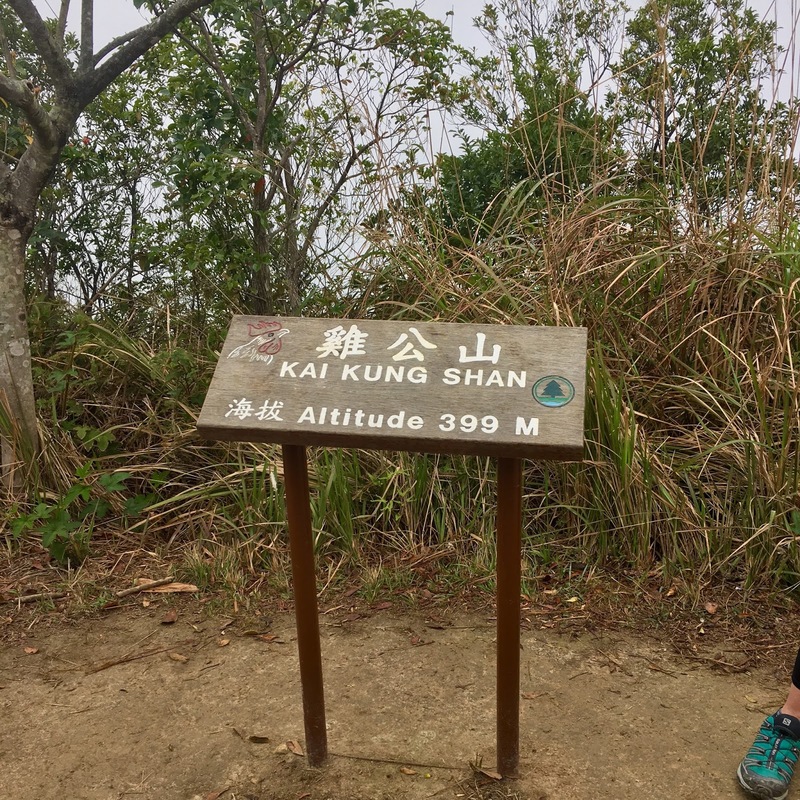 The first climb takes you up to Ngau Yee Shek Shan/Ngam Tau Shan at over 400 meters. Although it is quite challenging making your way up, the views of the mountains of Sai Kung and the South China Sea in the distance make rest stops along the way enjoyable (especially if you are there on a clear day). 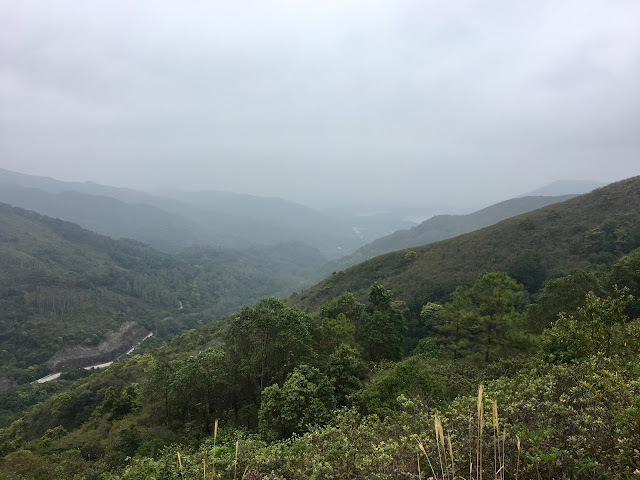 A rather long and gradual descent takes you to a camping area at Cheung Sheung. This was a large area but the only living creature we saw on this drizzly day was a cow. The second climb is short and sweet. Here you get the first views of the other side of the mountain toward Three Fathoms Cove and the skyscrapers of Ma On Shan. Another drop down sets the stage for the final and most grueling climb of the day. The trail is the most rugged and steepest yet as you make your way up to Kai Kung Shan at 399 meters. Sadly after all that climbing we found ourselves in a cloud with no hope for a view. It was all downhill from there. Literally. 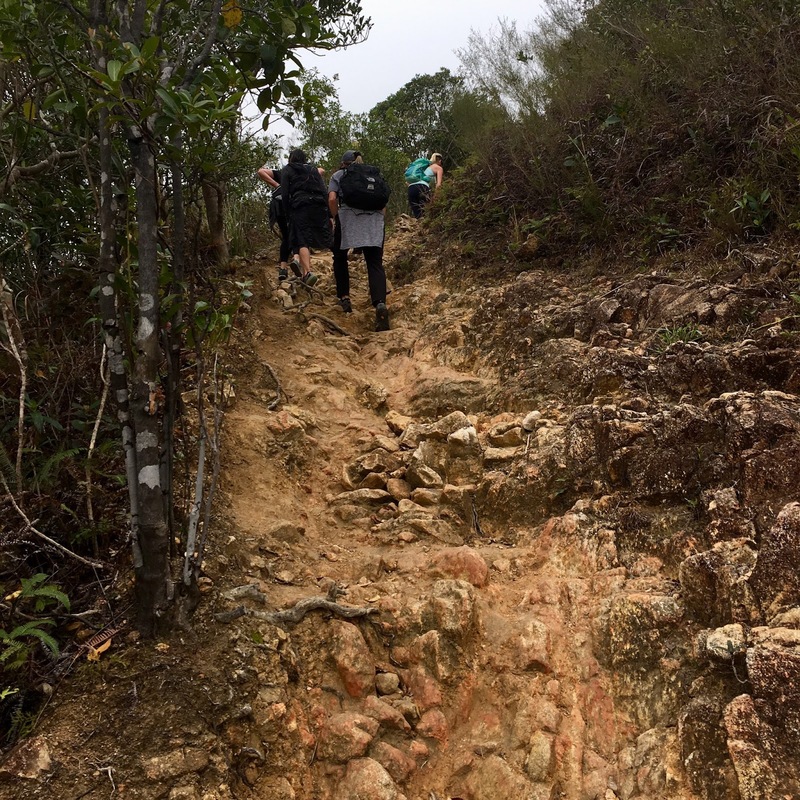 The trail gradually and slowly descends to Kei Ling Ha. Slowly because the trail is completely covered with irregular rocks. At the end of stage 3 there is a very nice picnic area, rest rooms and a vending machine with water. A short walk takes you to the bus stops.